Fountain Tire, one of Canada’s leading tire and automotive service providers wants to ensure that every Canadian is educated about the benefits of winter tires to take on the predicted harsh winter. 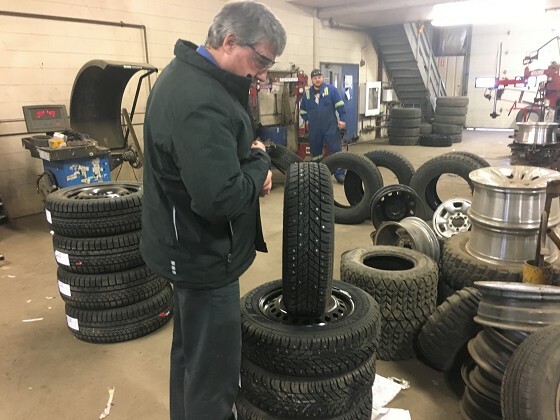 In an effort to do so, the Fountain Tire team is pleased to share key safety information and findings regarding the use of winter tires from the Thunder Bay Police, The Canadian Association of Road Safety Professionals (CARSP) and The Canadian Traffic Injury Research Foundation (TIRF). According to a report by TIRF, newer generations of winter tires make use of a flexible rubber compound that is less prone to stiffen in cold temperatures and have treads designed to improve traction on any road surface, whether it be wet, slushy, snowy, icy or dry and cold. In fact, winter tires have better overall traction at -40 degrees Celsius than all-season tires do at +4 degrees Celsius – an important function for consumers to note when making decisions about how to equip their vehicles for winter driving. economy, with a resulted reduction of 5 per cent in fuel consumption over the course of a year due to better traction. One element of the study also found that the universal use of winter tires resulted in a 5 per cent decrease in accident victims and 574 fewer road accident injuries per year, proving once again that while winter tires can be cost-savers, they are also key to personal safety as well. Fountain Tire is committed to providing Canadians with the safest tires for winter driving. related services to commercial truck fleets and off-road vehicles used in the agriculture, oil and gas, mining, and construction sectors. The majority of Fountain Tire managers own equity in their store. This partnership-based business model combines community invested store management with corporate intelligence to provide customers with service they can trust. The company’s shared ownership business model has enabled it to be named among Canada’s “Best Managed Companies” every year since 1994. Why is a snow tire better than a regular tread tire in winter? Are people now using snow tires more often? Fountain Tire Thunder Bay sell Goodyear, Dunlop, Kelly Springfield or whatever other tire is required for the vehicle. The Fountain Tire Thunder Bay has over 45 employees. Your operation has grown since your start here?